Allows you to sign a PDF document online. Free accounts are limited to 2 documents by month. To manage your signature, CLICK on the MANAGE SIGNATURES button in your SECURESHARE sidebar. This page will allow you to manage your stored signature (delete), upload a new signature from a file stored in your computer or draw a new signature. When drawing a signature, we recommend you to use a mobile phone or a tablet for precision. Although, your electronic signature doesn’t have to be similar as a handwritten one, since the technology limit the precision. You will be able to use your stored signatures while signing a document later. You will also be able to draw a new signature during the creation of your document. First, you need to import a PDF file in your SECURESHARE account by the Files interface (CLICK on Files in your SECURESHARE sidebar). The file will then appear by clicking on the New Document button at the top right of the eSignature tab. You can also go under the Files tab, find the PDF that you want to transform into a signable document, then CLICK on . 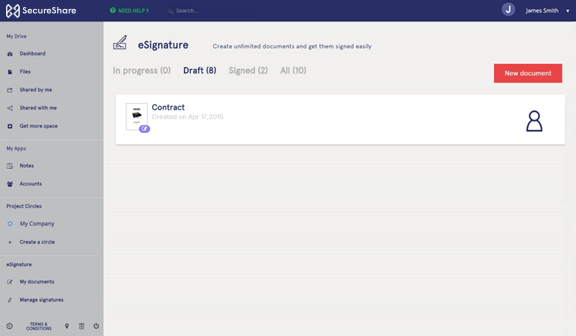 To create a signable document, CLICK on the desired file in the eSignature tab. When you choose your file, you will then be redirected to your signable document detailed page. Your ORIGINAL document will be duplicated and converted into a signable document. This signable document will be SAVED as a copy in a new folder when the signature process is completed. You can view the CONVERSION status while it progresses. First of all, select who will be signing. Only me? Me and others? Only others? 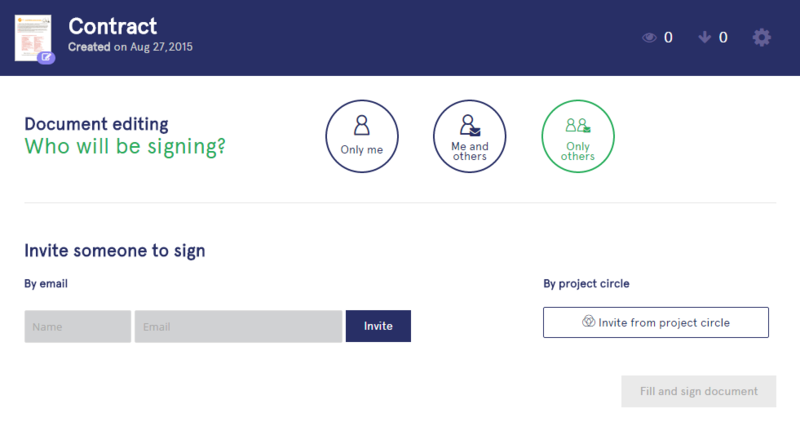 Then, you will be able to invite people by email or by a project circle. FILL AND SIGN DOCUMENT interface will allow you to edit your file, sign it and request other's signature. Depending who will be signing the document, four (4) different tools are available for the owner. If the owner is requested to sign, he will be the first one to do so by clicking FILL AND SIGN DOCUMENT. Your own signature won’t appear on the document until everyone is done signing. If this is the first time you get to sign a document, you will be requested to create your first signature. Every signature created will be available to reuse at any time in the future. For better results, use your mobile or tablet. 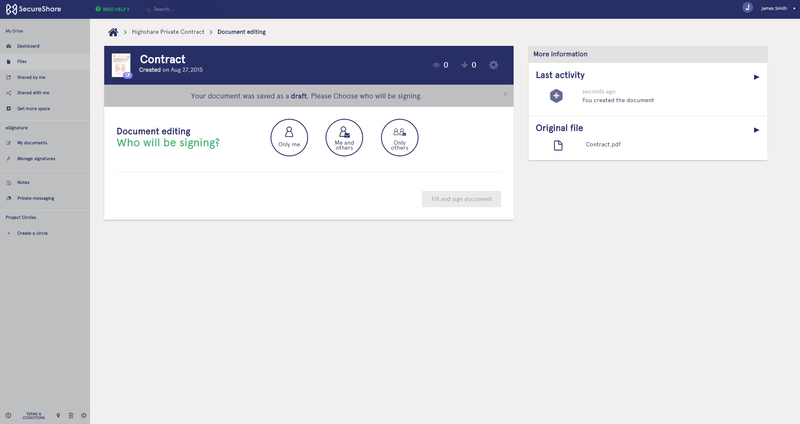 If you already an eSignature user, you will have the choice to choose an already existing signature (By selecting one in the dropdown menu) or to create a new one (By clicking on the CREATE NEW button). To place your selected signature on the document, CLICK at the desired place. You will be able to move it, scale it and delete it afterward. If your document must be sign by someone else, you have to select where the recipient need to sign. The recipient won’t be able to move it, scale it or delete it. If you invited more than one recipient, you can change it by selecting it in the dropdown menu. The owner will also be able to place static text and its size anywhere on the document. CLICK anywhere on the document to do so. The owner will also be able to move it, scale it or delete it afterward. The owner could also prepare a space where the recipients can add custom text. The owner will be able to move it, scale it or delete it. The recipient will only be able to add custom text in it. Once you are completely satisfied of your document and ready to request collaboration from your recipients, simply CLICK DONE. You will then need to confirm that you and the other signers will legally bound to this document. Only then, the recipients will receive an invitation to sign or add text. The recipient will receive an invitation by email, whether he is a SECURESHARE user or not, or if he has been invited by email or project circle. When CLICKING on the link received by email, the recipient will be redirected to a limited rights SIGN DOCUMENT interface. The recipient will be able to download the original file. The recipient will need to create its signature. The recipient will be guided step by step through the pages of the document. When the recipient filled all the requirements, he will have to confirm that he is legally bind to the document he just signed. Every signers of the document and the owner will receive an email confirming that the document is completed. The owner will be able to download the completed document by CLICKING on the link given by email, or by its SECURESHARE eSignature interface. The owner will also be able to share the document again by email or by creating a public link. Combined Download the completed document and the certificate merged into one PDF. Separated Download a bundle including the completed document and the certificate. Certificate only Download only the certificate of completion. Original file Download the original files in its state before the owner filled and signed it. Note that every completed document is compliant with the UECA and the PIPEDA requirements. Detailed tracking about the document is included in the certificate of completion accompanying the document. Once you filled your document and sent it, you can go back to My Document to track the last activity of your document, share it, download and delete it. From here you can have access to several informations about your document. Next to your document title, you can see how many time it has been viewed and downloaded . By clicking on , you can delete the document and redownload a different version. You can also share that document by link or email. You have access to other information about your document under the section named More information. By clicking on you can deploy the last activity and have access to precise information on when and who have seen, signed and downloaded the document. As a owner of a document, you will have access to your created files directly in your SECURESHARE account. At any moment, you will be able to delete a document. Please note that you are responsible for keeping your signed documents for legal questions.